This video is part of a “Grab Bag” series in which Matt Cutts, head of Google’s Webspam team, answers questions from users. 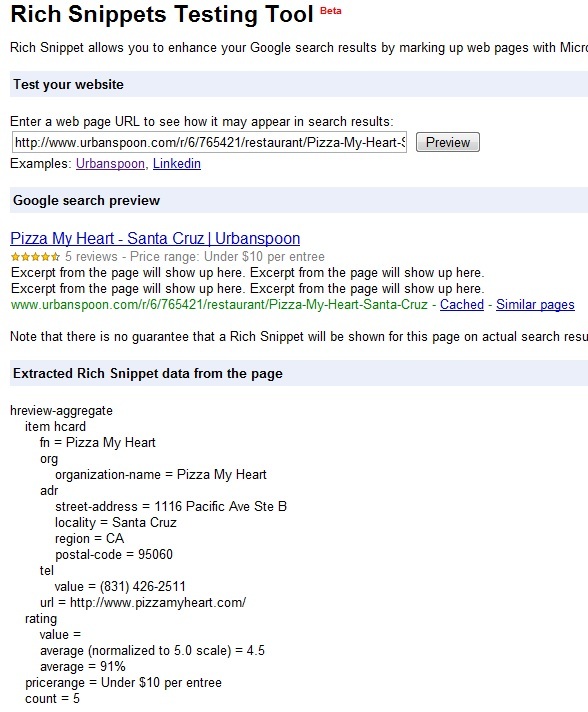 At the time Matt Cutts played down saying: “[…] its a good suggestion […]” and recommend that we look at the current website using Rich Snippets and try to understand how they have implemented them. And, to be honest, I was happy with the answer. But I was thrilled to see the notification in my Google Reader saying there is an update about Rich Snippets. The tool is pretty good, all you have to do is enter a URL of a page that has microformats or RDFa format embedded in the HTML. When you hit the magic button, the tool displays an example of the Rich Snippet which includes the star rating and the extra information (in this case the price info). What I really like about the tool is that it goes a step further and shows the extracted information. This is really helpful when debugging the formats. One other hidden gem is the rating calculation which clearly specified how the rating that is shown in the format of stars was achieved. Finally, I want to tip my hat in thanks and recognition to the Google Webmaster Team and anyone involved in making this tool! This entry was posted in SEO on October 27, 2009 by Adeel. 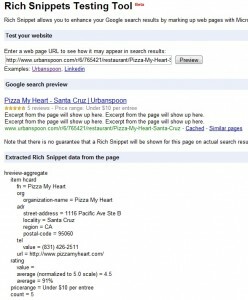 Yesterday Google confirmed that they do not use keyword meta tag in web ranking. To be fair, most of the SEO experts had worked that out (for years?). I believe Google did this because of a recent legal battle regarding copying of keywords. I always thought that way too. Description meta tag is a description of a page and although Google does highlight certain words, it doesn’t really rank results on the basis of it. I just hope people pick this up and start writing good user-friendly (or at the very least grammatically correct) descriptions. This entry was posted in SEO on September 22, 2009 by Adeel.